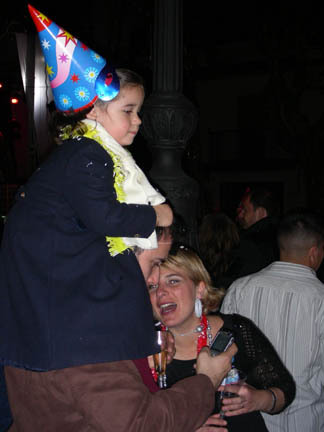 A Spanish Christmas is quite different from one in the USA. It lasts longer (until King's Day on January 6th) and has several different celebrations from what Americans enjoy. 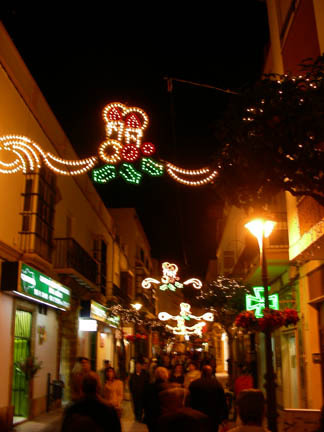 The town is lit up for the Holidays with overhead lights strung down the streets, plazas and pedestrian areas. 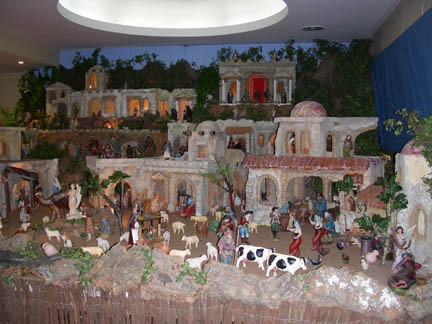 A life-size Nativity scene is near the castle and nearly every business has a miniature Nativity scene, called a Belen. Several homes in the old town area also have Belens and were open for public viewing in the evenings. 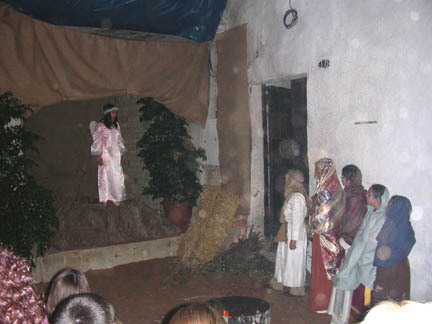 The best Belen, by far, was the one in a downtown pharmacy that was about eight feet square with a whole village climbing a hill towards the back. The village was complete with a potter, whose wheel actually turned, a scribe, a group of men playing cards on a flat rooftop, fishermen at a stream with real water, a camel train at the caravansari with the drivers around a pot boiling on the fire, the three Kings coming over the hill on their camels and, of course, the Holy Family in the stable. There were many other things happening in the Belen than can be described, it was a small slice of life in a town at the birth of Christ. You could walk around two sides of it inside the store and a third side was visible through the main display window from the outside and all sides were peopled with figures caught in daily life. The city had a contest for the best Belen, in several categories, and I hope this pharmacy won (we never saw the results). Christmas its self is not the big gift giving time as in the USA (Three Kings Day is). Although the commercialization of it in America is causing some families to give some gifts on Christmas. The big event in Rota for Christmas was the live Nativity. This consisted of taking some narrow lanes, in the old town, leading from the main plaza and converting them into torch lit paths. They let groups of about 50 people at a time follow the path, past a market with live chickens and goats and stalls of produce, along to the Inn, which was full and around some corners to a group of women listening to the Angel telling of the coming event. From there one followed the lane to the castle and saw the arrival of the Three Kings by horseback (I guess Rota doesn't have any camels). The group followed the Kings into the castle and a confrontation with King Herod and then outside to the stable where they presented their gifts to the Christ child surrounded by shepherds and goat herders with real animals. The final act at the stable was too far away for my flash to reach hence no pictures of it. Then we headed for the plaza to watch the bands and listen to the rock music along with most of the rest of Rota, both young and old. 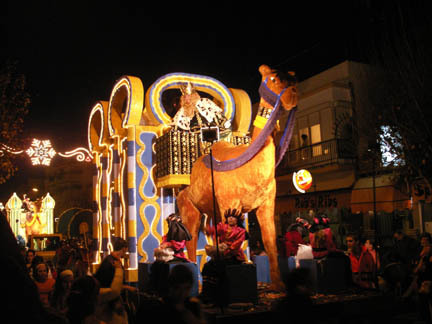 The big event for Spanish children is the Dia de Los Tres Reyes Magos (Three Kings Day). In America we call them the Three Wise Men. This is held on January 6th and is when they get their presents. The Three Kings are said to have returned from the Holy Land and arrived in Spain on the sixth of January. The Three Kings are named Melchoir, Gaspar and Baltasar. They represent the three known continents of Europe, Africa and Asia. Each is distinct, Melchoir, the white-bearded king of Europe; Gaspar, the red-bearded king of Asia; and Baltasar, the black-bearded king of Africa. On the evening of the fifth of January there is a parade of the Kings through the town. (All the towns and cities of Spain are having parades on this day.) In Rota the Kings Parade was led by about eight marching bands and floats of pretty girls throwing confetti and streamers at the crowd. The leading band kept the speed at a slow, almost funereal pace. After the pretty girls came the floats of the Kings, each float represented a camel with the King astride it. The Kings had a bin of candy on each side of them and threw the candy to the crowds with both hands. It was unbelievable how much candy they went through just in the tiny town of Rota. The whole country must have gone through tons and tons of the candy. Each King had a helper whose sole job was keeping the bins full of candy. This meant emptying a 20 kilo (44 pound) sack of candy into each bin about every 3 or 4 minutes. The Kings also threw small toys and plastic balls to the crowd. This went on for about 3 hours. The length of the parade route through Rota far exceeded the town's ability to fill the streets all the way along it. This was not a problem, it was an advantage for the children, of all ages. The children had plastic sacks from the grocery stores and would scramble for the thrown candy until all three of the Kings were past, then they would cut across the blocks and wait for the parade to come by again, and then do it again and again. We watched the start of the parade, went and ate at a Chinese restaurant and then watched it after dark halfway along the route. After dark it was more spectacular with the lighting on the floats, but harder to take pictures. 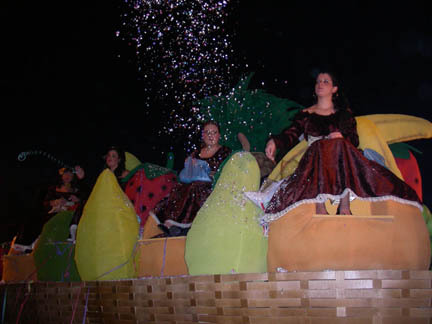 When the parade ended at the town's plaza the Kings threw toys and candy from the balcony of the city hall. The last part is when the children go up to the Kings and tell them what they want for presents the next day. This is like American children going to the mall's Santa and telling him their wishes. A good time was had by all this Christmas season, Feliz Navidad. On the second of January we went to Gibraltar.